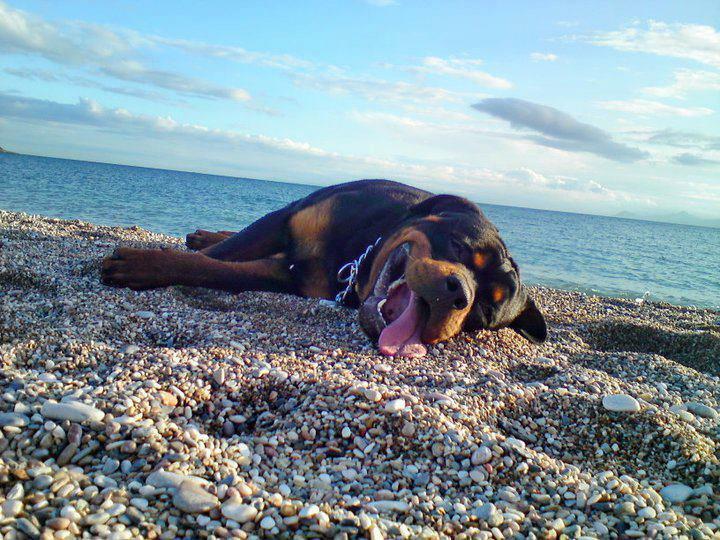 Rotties have a reputation for being tough dogs. However, every Rottweiler owner speaks volumes about these dogs’ soft sides.In this compilation, we see Rottweiler puppies with their softest and cutest sides. 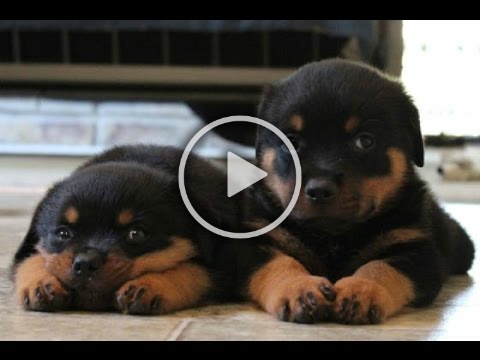 Be prepared for a compilation of some of our cutest Rottweiler puppies caught on camera.From puppies rushing their owners, playing with ball to puppies falling asleep these are just a few of the many funny puppies you'll find in this video compilation.The internet is melting with ‘Awww’s’ over this one. 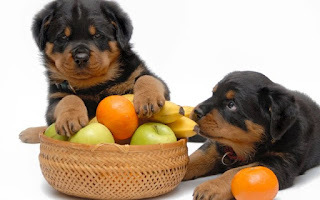 Dogs, like all other pets need a change in diet once in a while, fruits and vegetables make the perfect alternative in the dogs diet. All the following fruits and vegetables are safe for your dog to eat. 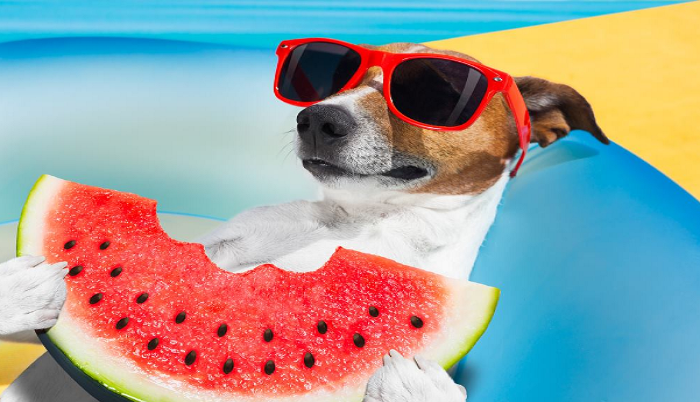 Be sure to wash all fruits and remove rinds, inedible skins, and seeds before feeding to dogs. 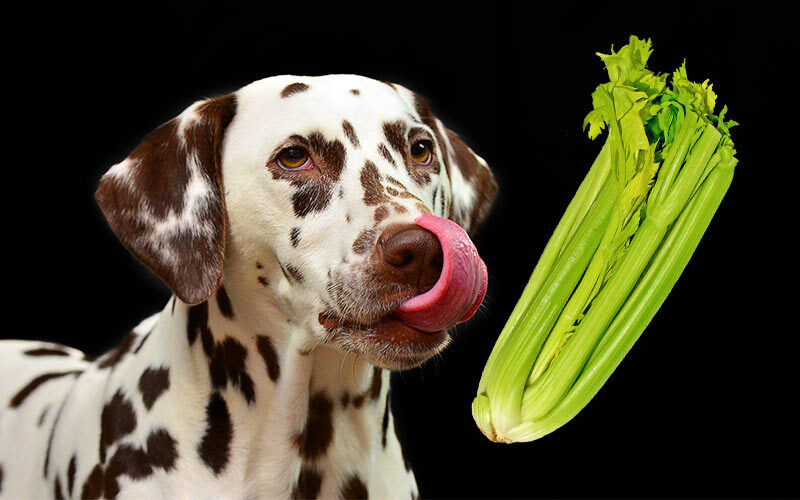 Here's the list of fruits and vegetables that are good for your dog. 1.Apple - Apples are high in fiber and low in fat, making them an ideal snack for overweight dogs who may have a lower metabolism. They're also packed with vitamins A and C which are essential for maintaining healthy bones and tissue. 2.Sweet Potatoes.- the sweet potato is a great source of various vitamins, Iron, potassium, and copper. Just like its name, sweet potatoes are tasty. 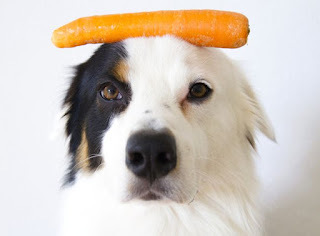 3.Carrots.- are an excellent source of vitamin A, potassium, and fiber, among other vitamins, all of which play an important role in dogs nutrition. 4.Watermelon.- this fruit is almost 92% water, so it is great for keeping your dog hydrated. It also contains Vitamins A, C, and B-6, as well as potassium which helps maintain healthy muscle and nerve function. 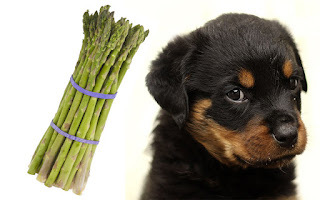 5.Asparagus.-This vegetable is suitable for your dog when cut up into bite sizes. It is a good source of vitamins A, C, B1 and B2, & K as well as other elements. 6.Pumpkin.-If your are looking for a good source of fiber for your dog, then the pumpkin is a perfect source. It is also a great source of fiber which will help alleviate the dog’s diarrhea and constipation. 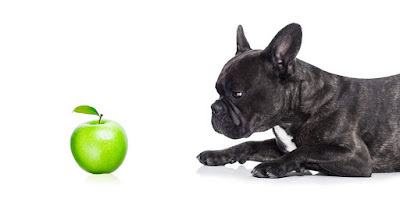 7.Blueberries.- are an awesome choice of fruit for your dog, and experts in the field all agree that this fruit is perfectly fine for your dog to eat.Blueberries are a superfood rich in antioxidants, which prevent cell damage in humans and canines alike. 8.Celery.- is rich in many vitamins and minerals: vitamin A, vitamin B, and vitamin C, and calcium, potassium, phosphorous, iron, and sodium. This vegetable improves heart health and can lower blood pressure while helping to fight cancer. Rottweiler gives birth to one of Britain’s biggest ever litters after having 15 puppies !!! 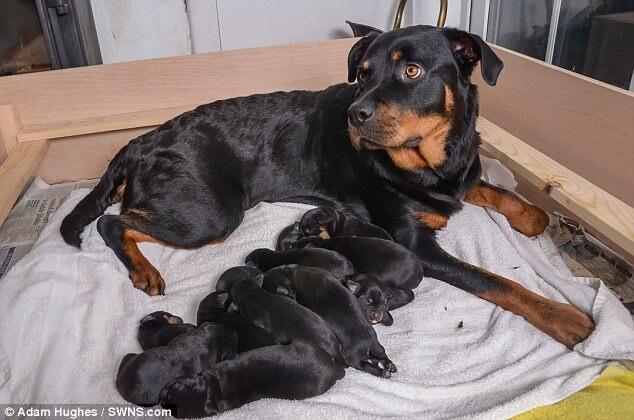 A Rottweiler dog has given birth to one of Great Britan's biggest litters ever after having 15 puppies. 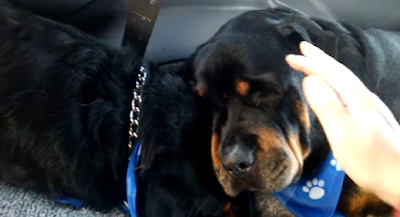 Owner Eleanor Usher, 47, had only expected two-year-old pet Jessie to have five pups, but was left very surprised when the dog's litter was three times bigger. 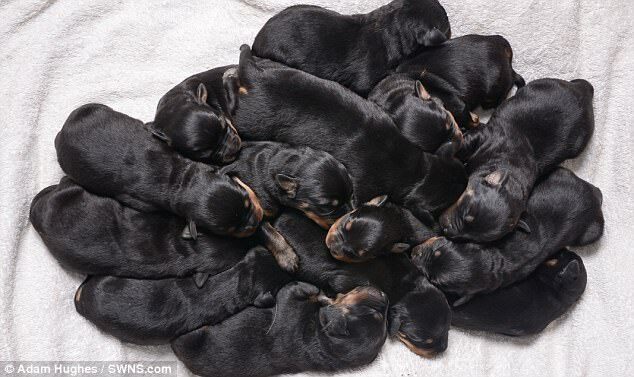 This is now Britain's second largest litter of puppies, after another Rottweiler had 18 puppies, a couple of years ago. Mrs Usher said: 'They are absolutely adorable, it makes me smile every time that I see them. 'They've all grown a bit, and are starting to get their own distinctive personalities. 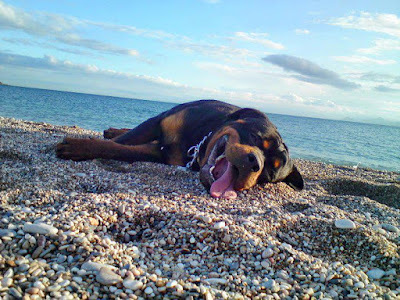 'The problem with Rottweiler pups is that they fight with one another - so there is lots of growling and noise down there during the day. 'They are starting to get their vocal cords, so the house has been a very noisy place over the last few weeks. 'Ian (Mrs Usher's husband) and I have a rota drawn up to feed the pups throughout the day and night. It's exhausting but worth it to see them. 'It's going to be very hard to see them go, but each of them will be going to a really good home. 'After the sixth puppy, I was saying: 'That's a good girl, you can stop now, you don't have to do anymore'. 'But they just kept coming and coming. We didn't even need to do anything to assist her, they were all just coming out without any need for help. She made it so easy for us. 'After the 11th, we started to look into records, and discovered that the highest in the UK was 18, and the second highest was 13. 'The way that Jessie was going, and the speed at which they were coming out of her, we were fearing that it would get as high as 20. Thankfully it was all over by about 8.00am. 'The 15th was smaller than the rest of them, and had a white mouth instead of a pink one, which was bit out of the ordinary. 'We were a bit worried about her and kept a close eye on her, but she is fine now. 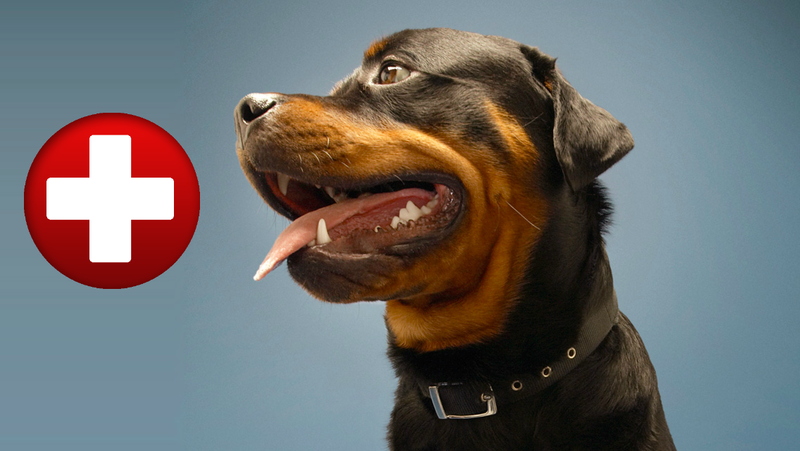 1.Dogs can see only black and white?.- recent studies suggest that Dogs actually do have some color vision but it's not as bright as a human's. 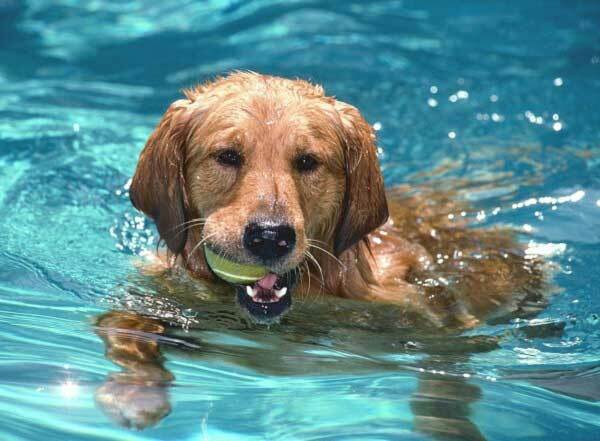 Dogs can distinguish blue, yellow and gray colors. They can’t discern red and green, but they can distinguish shades of gray, what allows them to see in the dark and dusk. 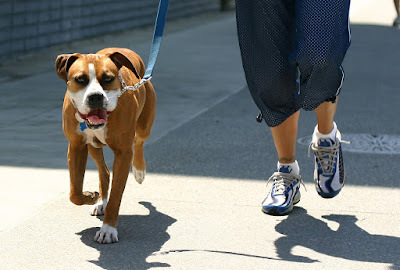 2.Dogs eat grass only if they’re sick?.- Dogs will sometimes eat grass if they aren’t feeling well to induce vomiting. 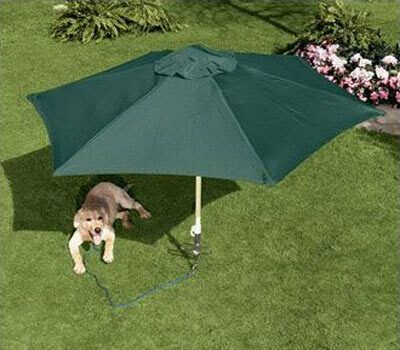 However, more often than not, dogs just like to eat grass. 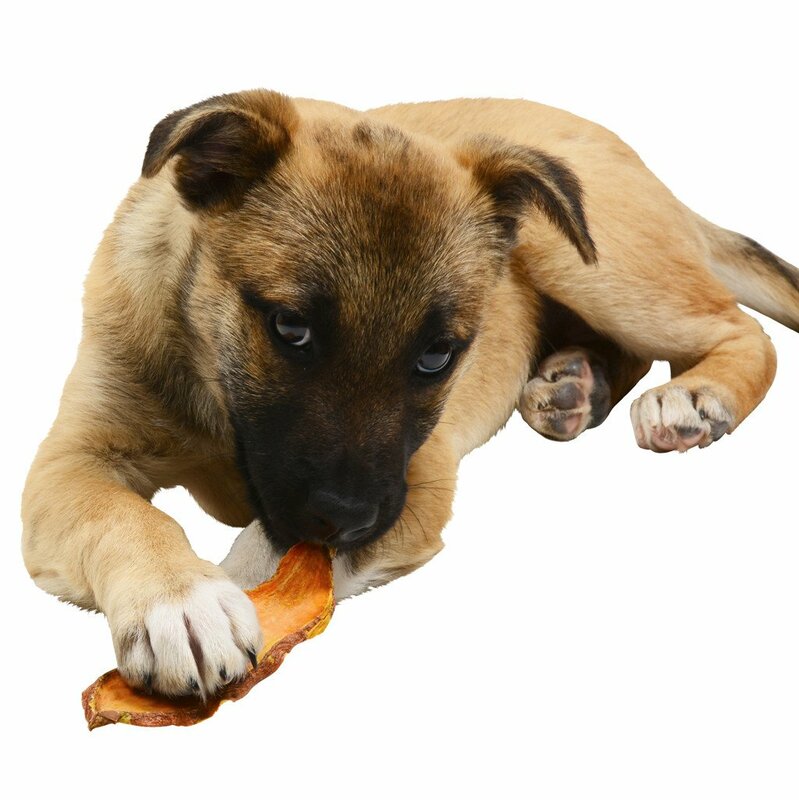 Dog ancestors used to feed on grass which is likely where their taste for greens came from. 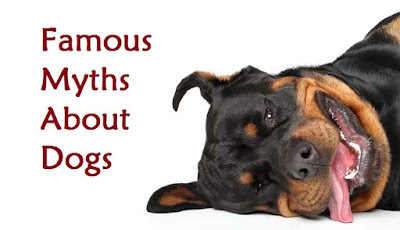 3.Dogs Age Seven Years for Every Human Year?.- Saying that a 1 year old dog is 7 in dog years doesn't make sense when you consider that dogs can reproduce well before one year of age. 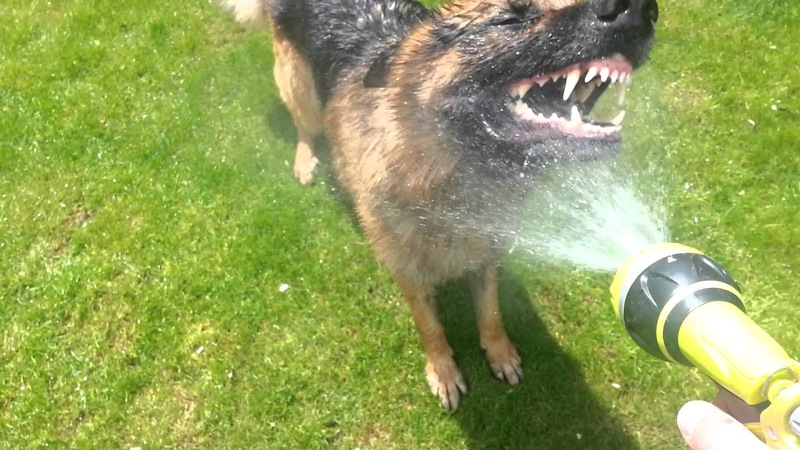 4.Dog mouths are cleaner than human mouths?.- according to scientists, dogs have just as much bacteria in their mouths as a humans, but of different varieties. 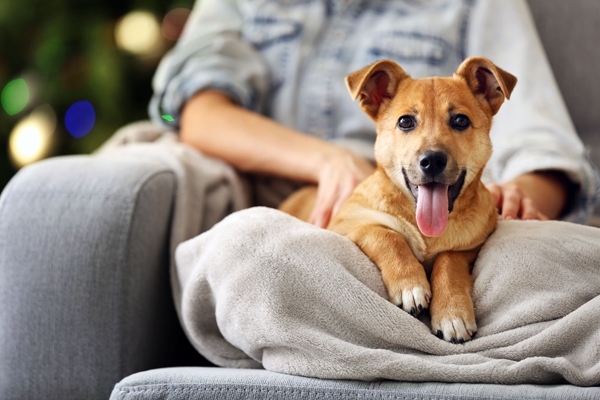 5.Wagging tail is a sign of a happy dog?.- This is not always true, tail wagging can also be a sign of fear, anxiety or impending aggression. 6.Dogs should eat bones?.- It’s believed that eating bones dogs will get a lot of vitamin D and calcium, but in fact bones can injure intestines and cause bleeding, inflammation and severe constipation. 7.Dogs hate cats?.- this myth is false and easy to disprove. Cats have a tendency to run, dogs have a prey drive and they chase smaller things that run. 8.A little chocolate won’t hurt my dog?.- Chocolate can be toxic and life-threatening to dogs. 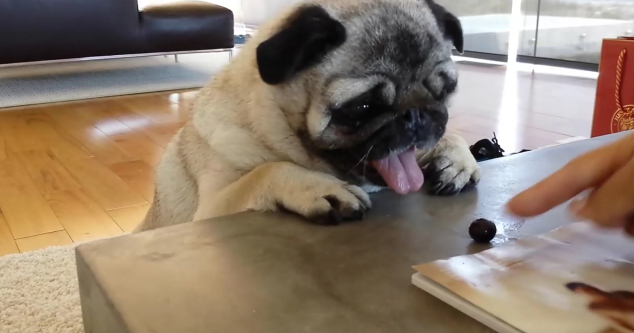 As little as 1 ounce of dark chocolate may be enough to kill a small dog. 1. Only walk your dog early in the morning or late at night. 2.Use the hosepipe. 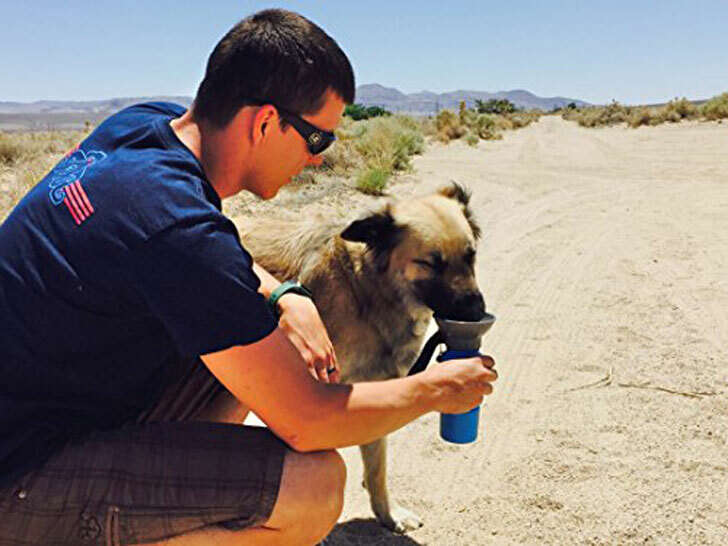 It’s fun for your dog and, more importantly, keeps them cool. 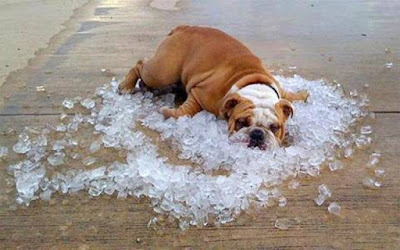 3.Offer an ice pack or wet towel to lay on. 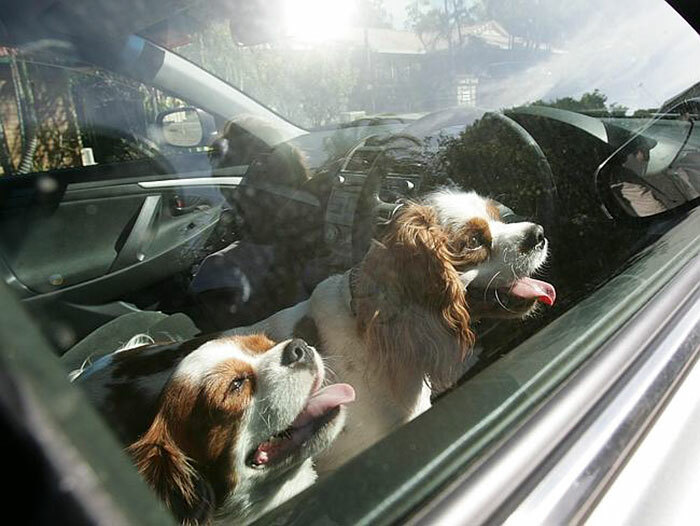 5.Don't leave your dog alone in the car on a warm day. 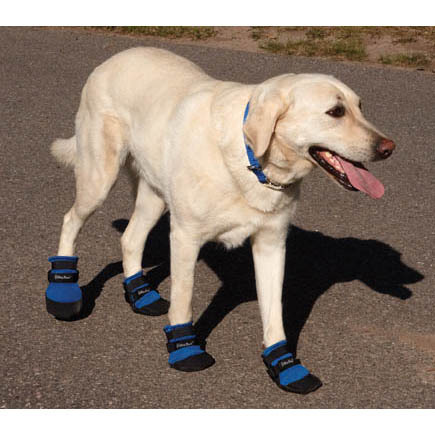 6.Make sure that whenever you leave home, you always carry water for your dog. 8.Take them somewhere they can swim. 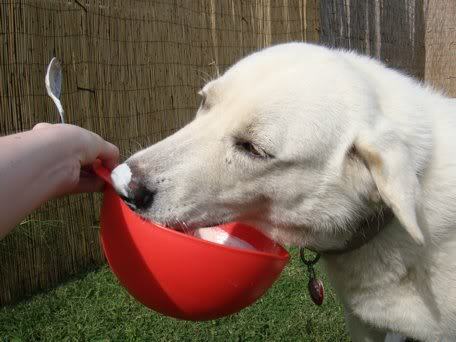 9.Give your dog frozen treats! 10.Check on your dog often.